You already know the Ringling Brothers & Barnum and Bailey have folded up the Big Tent for the last time, a sad event. Any thoughts we have had about running away to join the circus (a viable option to kids growing up in Northern Michigan in the ’70s) must be abandoned. Think of all the performers thrown out of work! Clowns will have a hard time—it’s no laughing matter—finding paying positions which allow them to scare the bejeebers out of kids. Maybe manning the Obamacare help desk? Little people will line up at unemployment offices seeking short-term work. The daring young men—and women!—on the flying trapezes had better hope Hollywood has another Tarzan remake in the works. PETA are, of course, animal “rights” activists. Since every right entails a responsibility, if animals have the right, say, not to be killed, whose responsibility is it not to kill? Ours, say PETA and other activists, and they are correct—if animals do indeed have that right. But the animals would bear the same weighty duty. If any animal has the right not to be killed, then no animal can kill another animal. Any killing would be a violation of animal rights. Thus if animals have the right not to be killed, the lion must perforce lie down with the lamb, or face the appropriate penalty. What that penalty should be and whose duty it is to enforce are open to question. The suggestion that PETA members be made to patrol the veldt armed with summons books and four-paired handcuffs should not be overlooked. Once killing is banned, and before the creation of the new heaven and earth, a lot of beasts are going to go hungry since it’s doubtful we can make enough pseudo-meat tofu burgers to placate even just the birds, many of which are finicky eaters. And then, for example, Polar bears have an unfortunate cannibalistic streak, and there is doubt raising awareness among the ice bears will be sufficient to curtail their murderous proclivities. Of course, we can argue that animals are allowed to slaughter each other, but that men are forbidden to slip the ax to our four-legged friends. But that would imply that man is different than animals, and lower than animals. Why? In this scheme, animals are superior to men. After all, men would be forbidden to kill animals, but animals would still be allowed to kill men, and that difference in power structure makes them superior. Of course, they could also be restricted from killing us, but that seems odd: they can kill each other but not us? If they can kill each other, but not us, that implies men are superior after all, since the life of an animal to another animal is nothing—or dinner. But the life of a man to an animal is much. And if animals are restricted, or barred, from killing us, who is it that is doing the restricting? Well, men. Again, that implies men are superior to animals, since we would use our power from keeping animals from their desires, and that power imbalance proves our superiority. There just isn’t any way to work the argument that animals have the “right” not to be killed and remain coherent and consistent, except in two ways. The Texas BBQ path, in which the superiority of men is acknowledged and animals are allowed to kill each other for meat, pleasure (chimps), and access to females (rams). And the path of Starvation, where all killing is disallowed. Good luck enforcing that. Cleveland Amory (the late, of course) thanks you. Cats do not. 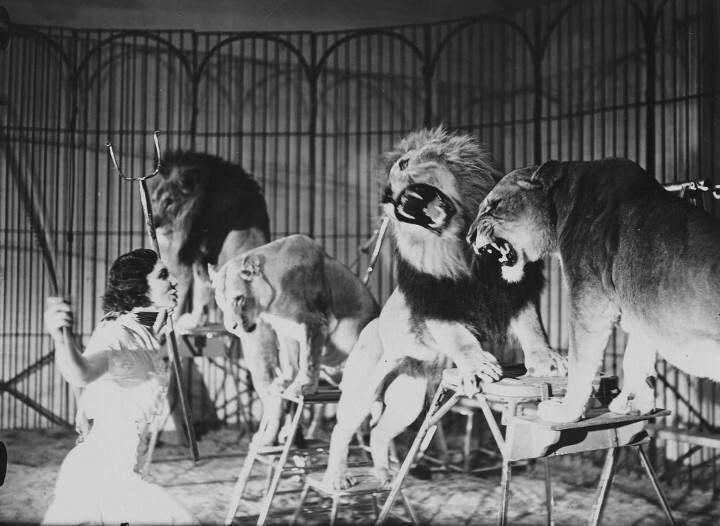 Technology and other venues ranging from zoos with naturalistic displays to affordable jaunts off into the wilds are what killed off the circus, not PETA. Some people just don’t understand post hoc egro propter hoc fallacy. The deer in my yard will have rights when I can make an agreement with them to munch on all the ivy and kudzoo they want and leave my hostas alone. PETA are a curiously irrational species. Perhaps a zoo would be the best answer. From where I stand, lions’s killing for food is akin to soldiers’s killing to survive wars. Out of necessity. No other choice. If we human beings are indeed superior or worthier animals on earth, we should be able to understand why some people believe animals are to be treated as kindly and humanely as possible. Being cruel to animals is not something we superior beings should be proud of. Get a dog, perhaps, then you might gain more understanding an animal rights activist’s point of view. What kind of responsibilities have been placed on babies since they have rights? They make a nice philosophical argument, even quoting first principles from Jeremy Bentham. Actually, its not prejudice at all, its cooking time. Anthropologists have studied such things and they found that the key factor for the desirability of eating a type of meat — and this was shown consistent across cultures the world over — was how long it took to cook, with the quicker varieties being more desirable. Chicken pretty quick, beef somewhat longer…and pork even longer still. One might conclude that evolution pre-programmed humans for fast food, but part of this trend is observed to be correlated with other myths & rituals indicating primitive people’s recognition that under-cooking leads to discomfort, disease and even death (pork has its cloven-hoof myth associations, and, as anyone knows, is home to some of the more nasty & harder to kill parasites & so forth). As I recollect (I learned this ages ago in a touchy-feely anthro elective I had to take decades ago), this cooking-time issue was/is also a factor in the undesirability for human cannibalism (and we thought not eating our neighbors was due to good manners!). Does this come under “don’t laugh or I’ll say something nice about Peta”! It’s animal cruelty which matters. Animal killing is one of those unpleasant facts of life. I don’t think anybody sane advocates animal cruelty. There will be argument on what constitutes cruelty. Alan are you sure it’s not the slugs? 14th Feb is the date to start putting down the slug pellets (the animal safe ones of course which dissolve and fertilise the soil.) An old gardening gent told me that. He used to go out at two in the morning with a hat pin. I couldn’t do it. Hire a hedgehog or as I’ve found, sprinkle ash round the edge of the Hosta area and they won’t go near. No idea about the deer! The only solution apart from expensive scare contraptions which they soon learn to ignore is a fence. I’ve seen them clamber over four feet fences. Clamber was the word! I’d feed them something tastier than host. Double pleasure. The deer shouldn’t be allowed to eat the host! That sounded really bad. The typo thing’s playing games again. Wants costa unless it’s capitalised. Now apparently it’s over it and lets it be. Can you spell “Anthropomorphism” ? Anthropomorphism is the attribution of human traits, emotions, and intentions to non-human entities. Also look up the pathetic fallacy, the attribution of human feelings and responses to inanimate things or animals. I have heard the argument made that PETA is the “wacky” extreme front group for animal rights whose real purpose is to take attention from HSUS which is trying to mainstream many of the same extreme beliefs regarding animal rights. Is it PETA or nothing? Animals have emotions and whether their suffering is as great as ours is assumed. If you call a person knowing their mortality and therefore appreciating peril and danger and self reflecting in a deeper way then they probably have a greater capacity in that respect. They certainly have the capacity to suffer. The evidence of even wild animals displaying emotions towards humans is overwhelming. Domestic animals can be induced clinically to develop depression in short order. Surely nobody denies these things? How queer if they do. As for inanimate objects well that’s silly, obviously not merely pathetic. Anthropomorphic is a tired word these days, it’s working harder. Just being longer doesn’t make it prettier. Words don’t work like that. Well, according to PETA it is. Now the coyotes are gone and the rabbits and deer are coming back. The fox are bolder than ever. So if you want to control the deer, importing some coyotes will do it provided they have some where else to go. There have been recent sightings (pictures on facebook) of very large individual coyotes again (large enough to look like wolves) I won’t tell you about the black bear that was taken away by animal control last year. I know a person whose garage has been invaded by animal critters, and the progeny of the animal critters. The guests have taken up permanent residence in an abode that they neither own or pay rent on. The person who actually owns the garage and pays taxes on it will not take action to eradicate the intruders. Why? “Because it’s their home!” Obviously, they need the privacy. Flying out of Tampa I witnessed a TSA training exercise (don’t know if was drug test or explosives test but MAN were those dogs happy about passing. I s’pose PETA sees the use of dogs for such purposes wrong and ignoble. I’m guessing they believe service animals are beneath helping disabled people and that practice should be ended? I suppose they’re not thrilled about people with pets, period. I could be wrong but I’m not about to go to their mission statements to confirm. Where do cockroaches fit in there? Is it ok to eat a cow if we sneak up on it? Feeding the wildlife in England has rather less scary consequences than in North America and is considered a national duty in some instances. No bears, no wild dogs. A few wild bore in the New Forrest and an enthusiast has released wolves into a fully enclosed 18 acre site in Herefordshire. Nothing wrong with feeding foxes. The REAL beautiful animals. Keeping ducks means you can’t encourage them and they aren’t encouraged in the rural areas. In towns they are considered a prize or a privilege to see. One in Epping was seen carrying a ‘southern fried chicken’ box along the same stretch of road three weeks in a row. Either he likes take away on a Friday or he has friends with influence. In Canada I was fascinated by the idea that there were bears in the woods! Every shopkeeper and driver was interrogated for bear stories. Knowing about these things as a matter of fact is just not the same as being there. Something so ordinary as the fact of bears suddenly becomes exciting. Like Tigers in India. They hide in banyan trees. They wait for unsuspecting tourists who taste sweeter. Milton, the PETA person doesn’t have a point any more valid than the converse or is it called the inverse? They do all experience pain though. Even cockroaches as they exhibit pain avoidance behaviour. Is it the sense of self which gives us our experience of pain? I believe so. Pain is not, in my view, the same in nature. Just as intellect is not all the same in nature although it is the same in essence! Cockroaches have six legs, aka six locomotive corners. There is distinction between a cockroach and a cockerel. They are separate bodies, thank goodness. Definitely distinct. Just as a human is a separate body from an ape. You mustn’t creep up on cows! That cult is dead. Never be complacent. Ironically, this morning’s paper had this about a coyote eating a little dog in Mississauga. I live about 25 km from Mississauga. It’s a city of 750,000 people. Ah, That’s a good reason not to encourage the wildlife! I won’t read the news link. Good reason to be cross with people feeding the wildlife.